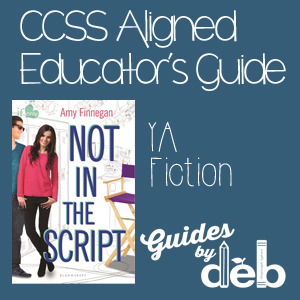 Amy Finnegan’s Not in the Script (Bloomsbury, 2014) is a swoony, dreamy, delightful romp into the world of teen screen stars. Cleverly told in alternating points of view, I found characters Emma Taylor and Jake Elliot to be perfectly cast for their roles in the wildly popular television series, Coyote Hills. Emma is stellar – on and off of the set. She’s an awarding winning actress in search of authenticity in life and, most especially, in love. Jake, a model of Abercrombie hunkiness, decides to step off the runway to join Coyote Hills television cast. His motive? His mother is disabled and he desires to be closer to her. (Who wouldn’t fall in love with a gorgeous guy led by a tender, loving heart?) Enter dastardly ego-charged leading man Brett Crawford; self-centered Rachel, the manipulative bestie; and paparazzi with piranha-like appetites and, my friend, you have the makings of a deliciously angsty drama! The Educator’s Guide reads like a Screenwriting 101 course. In it, students are presented basic formatting structure and terminology of scriptwriting. They are then led through a series of character analysis, plotting, and storyboarding activities. The culminating project is a book trailer starring the cast of Coyote Hills. Lights! Camera! ACTION! Not in the Script is a fun read – the perfect balance of steamy and sweet. Feel free to download the Educator’s Guide to get a sense of the creative writing possibilities Emma, Jake, and Brett inspire!